If you are in need of a battery for your RV, you have come to the right place. Here, you will learn about what makes a great RV deep cycle battery, as well as which batteries on the market are better than others. 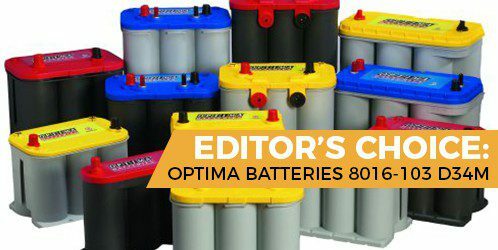 In this review, we will show you to five great RV batteries from brands like Optima Batteries, Universal Power Group and V-Max Tanks. They have their share of great features, in addition to one or more blunders that hold them back. Which is the best RV deep cycle battery? Has a great reserve capacity. Can be placed anywhere in the RV. Can last a long time. Has a metal carrying handle. Resistant to shocks and vibration. Is a clean, effective power source. This first battery is by Optima Batteries. This battery is known to both deep cycle and start as a dual-purpose battery, as indicated by its blue lid and light grey body. This battery can be used for either an RV or a boat. This battery offers a reserve capacity of up to 2 hours for consistent performance. It is also touted as a very resilient battery; 15 times more resistant towards vibration compared to the average RV deep cycle battery. This is a versatile battery, so if you do not have a designated place to put the battery, it can virtually go anywhere on your boat or RV and still run great. The cylindrical cell design of this battery is beneficial in multiple ways. Firstly, the shape of the battery promises a power source that is clean and effective. Secondly, the design is safe for not just you as the user, but also your family and the environment around you. The 2 hours of reserve capacity is a good thing, providing you with a longer shelf life to give you the energy you need, no matter where you are. This battery is known to be one that can overcharge. That is when a battery receives too much charge than it can handle. Overcharging can possible shorten the life of the battery exponentially. This final deep cycle battery for RVs come to us from ExpertPower. This battery, aside from use on an RV, can also be used for a home alarm system, power supplies, solar systems and more. This battery is known for having a rugged exterior made of ABS plastic. Don’t worry if the battery drops to the floor, as it can take quite a beating before it is gone for good. This is a non-spillable battery that prevents any liquids from leaking out, thanks to a fiberglas may inside. You can also be guaranteed a hazard-free and safe experience with this battery. This is a very inexpensive battery; the biggest savings on an RV battery that is in this review. It isn’t heard of to come across a battery that costs less than 100 dollars, but here it is. This is the smallest battery in this review, at just 7 inches on its longest side. It’s versatile, future proof, and still won’t shake or jogle around as you drive your RV. If you are not satisfied with your RV deep cycle battery, you can return it within a 90-day window and get a full refund. There is no indication that this may be a deep cycle battery at all, but instead just a regular battery. The product information rather indicates that this is a backup battery rather than just a battery that you would use for permanent use. May not be a deep cycle battery after all. This deep cycle battery for RVs is the Odyssey PC680. It is a very affordable battery, but at the same time, you might just be getting what you are paying for. You can use this battery for more than just RVs, such as with boats and motorcycles. Odyssey stresses, however that this is a motorcycle battery. This battery promises a service life of around three to ten years. While it can be hard to predict how long it lasts, do not expect it to die out at the bare minimum of three each time. This battery is tolerant to changes and extreme shifts in temperature, no matter if it is extremely hot or cold outside, it is still guaranteed to work for you. Like the battery from Optima Batteries, this battery also sports a cylindrical cell design. It promotes a clean source of power so that it does not work to harm people and the environment, which is very helpful this day and age. This is also a battery that does not spill. This cheap battery can also take a beating, with a cycle life that is longer than 70 longer than those found on average deep cycle batteries for RVs. At 80 percent depth of discharge, this battery can deliver up to 400 cycles. This battery also has a fast recharge time, and it can take anywhere between four to six hours to reach a fully charge. This battery’s warranty doesn’t cover usage on RVs. If you use this warranty on another vehicle other than a motorcycle, this voids the warranty, and if or when this battery dies, you cannot get a new one for free. Warranty is useless on RVs. Another affordable, low-end deep cycle battery is brought to us by VMAX Tanks. This battery can be used for RVs, boats, motorcycles and even motorized kayaks. This VMAX battery is also considered “dual purpose”. This battery comes with a metal, h-shaped handle for easy grip and pickup. With this handle, it feels like carrying a bucket of kitty litter. The running time on this battery is roughly around four to nine hours, depending on the motor that you use it with. The battery undergoes a unique assembly process that promises the most strength, reliability and performance possible. This is a non-spillable and nonhazardous battery that makes it safer to use than the typical battery for RVs. This battery is immune to any shocks and vibrations that might otherwise affect the battery negatively. Shock absorption and rumbling, clearly will accelerate the overall life of the battery, so you know that you can count on this battery to last a long time. For RVs, this deep cycle battery requires a higher charging voltage than usual. This is an inconvenience, as you will need more time invested in order for the battery to be fit for use on a land vehicle, such as your RV. Need more time to use on RVs. This next deep cycle battery for RVs is from Universal Power Group. This is considered a step up from the cheapest battery on this list, but they aren’t expected to last a long time; up to three to five years. At 64 pounds, this is a very bulky and heavy battery, so you know this will be a stable and resilient battery for as long as it is running. It may be hard to carry, but fortunately, there is a handle that you can use to lift it. The running time on this battery is roughly around five to ten hours, depending on the motor that you use it with. It is not the most expensive for least expensive battery, but we feel that it is decently priced for what it is worth. This is a battery that is highly versatile; you can place it anywhere in your RV and be resistant to shocks and vibration. This battery can withstand temperatures of up to 145 degree Fahrenheit. If you take your RV in the hot Arizona desert, then you still won’t need to worry about providing cooling for the battery. The major flaw with these batteries is that they will not seem to use all if its charge, so it is rare to come across a UB121000-45978 that will charge to 100 percent. From the way we see it, this is underwhelming, especially for a large and heavy battery. Does not last a long time. 1. What are the different types of RV batteries? Which one do I need? There are two types of batteries for the RV: Engine batteries and house batteries. Believe it or not, you will need both batteries for an RV. Recreational vehicle require both house batteries and a startup battery for its engine. House batteries are meant to provide power to an RV or other vehicle for long periods of time. Engine batteries are meant to help jump-start the car so that the car goes from off to on in just a few seconds. Think of engine batteries as sprinters while house batteries are marathon runners. 2. What is the best charger for the RV battery? Deep cycle batteries have unique needs when it needs to recharge and maintain power. However, if there are charged according to a schedule that prioritizes in temperature and chemistry dependency, they will charge quicker and last long than usual. With that said, a “Smart charger” is created to handle fluctuating charging schedules of deep cycle batteries for the RV. You will also need a battery charger that has what is called a “maintenance float phase” so that the battery can be prevented from losing any electrolytes. 3. How can I charge an RV battery with solar panels? There are also solar powered battery charger that require nothing but sunlight. They are also cost-efficient, silent and environmentally-friendly. To power your RV battery from the sun, you will need to purchase a solar RV battery charger. The big benefit to these types of chargers is that they do not require electrical power in order to run. 4. How to charge RV battery while driving? To charge a deep cycle RV battery while driving, you must first begin with the VCR, also known as the voltage controlled relay. VCRs can instantly disconnect and can be used to parallel auxiliary and starter batteries. When the relay on the VCR is closed, the two batteries become paralleled. The relay opens when the RV starts. Then, the RV batteries become disconnected once you turn the RV off, adjusting the voltage to a fixed level. Your RV’s power source is also considered a battery. Connect your deep cycle battery to the power source, and use high quality plugs and cable in order to connect the two. High quality plugs and cables are capable of transferring large amounts of energy, and also ensuring that the connections are safe and secure. As long as the battery is securely connected, it will not deplete any energy. It is important, however, to not overcharge the battery. When you mistakenly overcharge an RV battery, observe the level of electrolytes and add some distilled water to the battery. Be sure to check your batteries often, especially during harsh weather conditions. 5. How to install an RV battery disconnect switch? Installing an RV battery disconnect switch onto your RV is a rather painless and simple task, although if you are used to doing a similar task with other equipment or technology, it could instead be confusing, such as connecting the positive side of the battery to the negative side of the switch. Instead, all you need to know is to be sure to attach the positive side of the switch directly attach to the positive side on the battery. The negative side of the switch should be connected to a circuit breaker or fuse. This will prevent any power surges that the RV might experience. Some assembly processes will connect the switch to the negative side of the battery, but this procedure has not been confirmed by specialists in the battery industry. 6. How long does a deep cycle RV battery last? An RV battery can last in between three to ten years, depending on multiple factors. The first factor is the quality of the battery, where a good quality battery is sure to last longer than a mediocre-quality battery. Secondly, the usage is another thing to consider. If you use the battery too often or not often enough, the battery will tend to die sooner than later. Using the battery regularly and appropriately will guarantee the longest life possible. Thirdly, the quality of the motor is also a factor. If you have a powerful and aggressive engine and/or motor, the battery will require more energy than a smaller engine and/or motor. Proper care of your battery is important when attempting to make it last as long as possible while serving you and your RV. The best RV deep cycle battery is none other than the Optima Batteries 8016-103 D34M BlueTop Starting and Deep Cycle Marine Battery. To put it simply, this battery from Optima is a wonderful battery for RVs that will get yours running for years and years with no issues. With this battery, its cylindrical cell design promises clean power and effective performance from day 1 to day 1000. This battery is simply the best one for your money. This is the most expensive battery in this review that you can buy, and yet it is one that most RV owners should be able to afford. With more money, you get larger and more benefits, and that it honestly the biggest bang for your buck. The runner up in our book is the Odyssey PC680 Battery. If you’re not committed to spending as much on the Optima deep cycle battery, choose the Odyssey battery. The Odyssey battery has a long life span, and can run no matter how hot or cold it is outside.